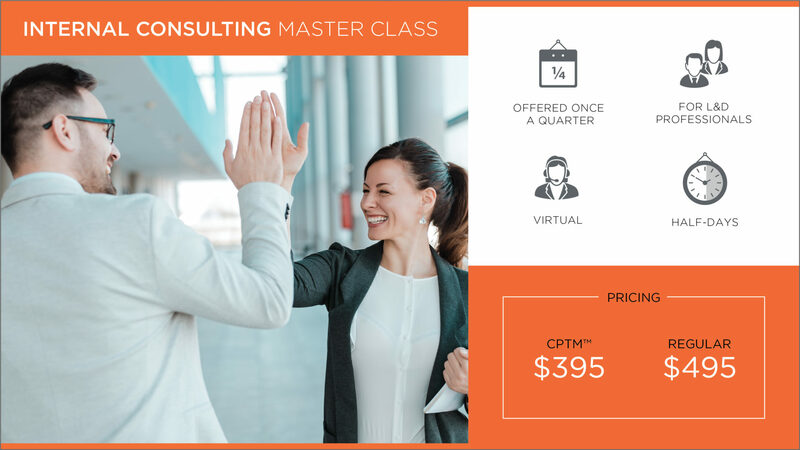 This highly interactive half-day master class will equip you with tools and tactics for managing the consulting process in your organization. By emphasizing the strategic competencies defined in the Training Manager Competency Model™, this course will prepare you for your role in partnering with internal clients. Attend the internal consulting master class and take your career L&D to the next level with its targeted focus on your ability to partner successfully with your organizations as an effective and credible internal consultant. Download a copy of the program flyer to learn how this course can benefit you and your training function and contact us if you have any questions.